Traffic investigators are seeking the public’s help in identifying the driver involved in a fatal hit and run collision. On November 8, 2018 at approximately 5:33 PM, a 75 year old Ontario resident was struck by a motorist while attempting to cross the street in the intersection of N. Mountain Avenue and W. Flora Street. After the collision, the suspect vehicle continued to drive south on N. Mountain Avenue. 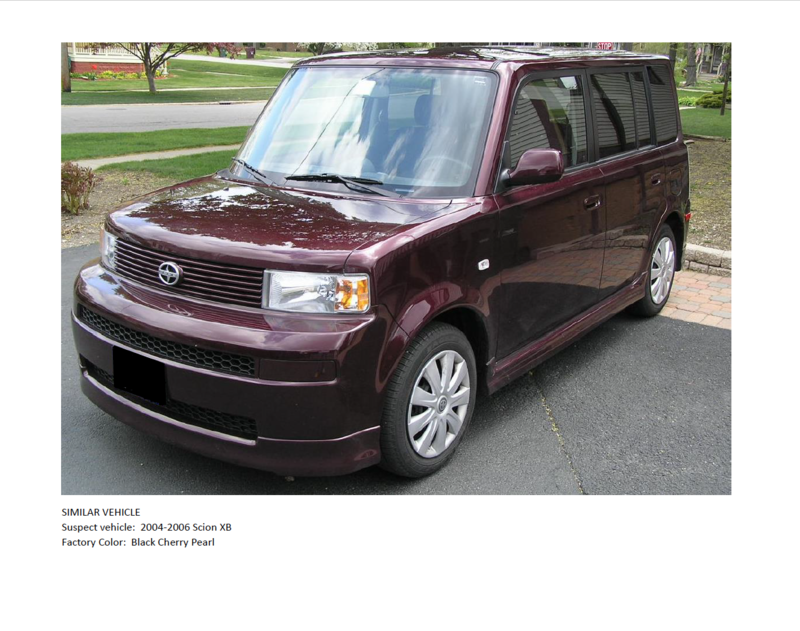 The suspect vehicle is a plum colored 2004-2006 Scion XB. The vehicle should have collision damage to the front of the vehicle. Anyone with information regarding the collision is asked to call the Ontario Police Department at 909-986-6711, or Detective Fred Ruiz at 909-408-1808. A photograph a similar type vehicle is attached. Information can also be reported anonymously by calling WE-TIP at 800-78-CRIME or on-line at www.wetip.com.